Our atmosphere is made up of several layers of various gases, predominantly nitrogen (78%) and oxygen (21%), held in place by the earth's gravity. It supports life and protects us from meteors and harmful elements of the sun's rays. Immediately above the earth's surface is the Troposphere, which varies in depth from around just 7km at the poles to a maximum of 17km in the tropics. This is a warm, dense, moist and turbulent layer containing more than 90% of our atmosphere's mass. Immediately above this is the Stratosphere, a dry, thin, stable band approx 40 km deep, where the temperature is around −60°C. At the top of this is the ozone layer. Ozone is a rich, unstable form of oxygen which at ground level is a pollutant, harmful to breathe, but at high altitude provides a protective layer which filters out much of what would otherwise be harmful ultraviolet light. Above this is the Mesosphere, a band approx. 35km deep in which most meteors burn up as what we see at night as shooting stars. Temperature at the top is around −100°C. In the Thermosphere above, which is several hundred km deep, temperature rises with height. It is in this region that auroras occur in the polar regions. They are the result of charged particles of solar wind being deflected by the earth's magnetic field towards the poles. The impact of mankind on our global environment is reaching crisis point. Industrialization, urbanization and the vast areas set aside for raising cattle and for the cultivation of mono crops has destroyed much of the world's ecosystems and the diversity of life they once supported. A significant side effect of all this is the massive amount of carbon dioxide (CO2) being released into the atmosphere from the burning of fossil fuel. We now talk about our 'carbon footprint', i.e. the amount of carbon produced by each of us individuals going about our daily activities - using electricity, driving motor vehicles, flying on passenger jets etc. It has been calculated that an average western family living in a modest home consumes enough power and fuel to release in excess of one ton of carbon into the air each year. It is widely believed in scientific circles that this is causing what is commonly referred to as the 'greenhouse effect', whereby not enough of the heat received by the earth from the sun is able to escape our atmosphere, bringing about a gradual warming of the planet. There are those who argue that oxygen is the principle greenhouse gas and they are quite right. However, the amount of oxygen in our atmosphere remains remarkably constant. 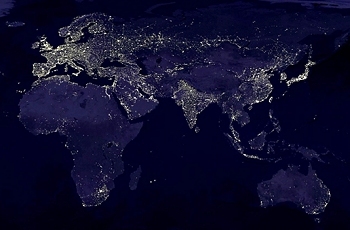 Even though the other greenhouse gasses such as methane and carbon dioxide amount to less than 1% of our atmosphere, it is the sudden and rapid increase in the release of these gases in recent decades that appears to be causing an imbalance that could, if not checked, jeopardize mankind's future survival on this planet. Carbon dioxide is evenly spread throughout the atmosphere. Since measurements of the carbon dioxide content in the atmosphere began in 1948, it's concentration has increased by almost 30%... in just 60 years! Under normal conditions gases like carbon dioxide help to stabilize the earth's temperature and climate, maintaining conditions of minimal temperature fluctuation and heat loss necessary for the diversity of life on earth to flourish and evolve. Emission levels over the past few decades are believed to be responsible for a monitored average increase in the global temperature of a little over 0.6°C. This may not sound like a lot, but being the average means that some places may have in fact got colder, whilst others, like for instance the Arctic, have warmed by more than 3°C, as evidenced by melting icebergs and receding glaciers. The debate over whether global warming is man-made is now over, with consensus throughout the scientific world that it most certainly is, despite the multi-million dollar 'denial' campaign funded by corporate interests for short term financial gain. We may very well have already passed the point of no return! The most overwhelming evidence comes from the examination of ice cores drilled in the polar regions, which hold a record of both temperature and carbon dioxide (CO2) content of the air for many thousands of years. 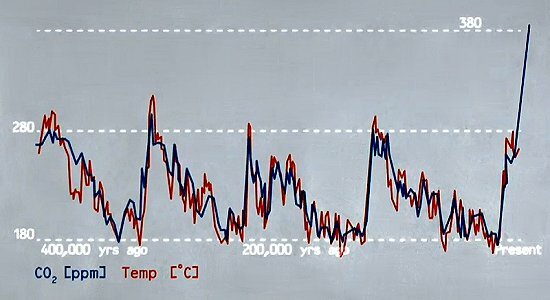 The graph below, explained in the recent documentary Earth - The Operator's Manual shows how, over the past four hundred thousand years, the earth has gone through four cycles of cooling and warming. It illustrates the co-relationship throughout that period between the temperature and CO2 content in the atmosphere, which until recent times had never exceeded 288 parts per million. Since the time of the Industrial Revolution CO2 content has continued to rise until reaching today's level of more than 380 parts per million. Is it not logical to expect the temperature to continue to rise proportionately. Can we afford to ignore this clear warning? Weather systems are becoming larger and more extreme, as we have seen in the severity of recent cyclones and hurricanes battering Japan, Taiwan and the Gulf coast of the U.S.A. and in late 2012 New York City. 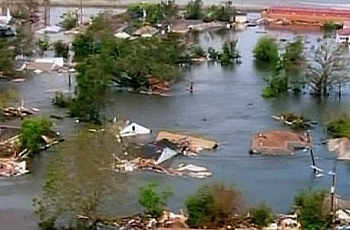 When Hurricane Katrina devastated 100 miles of U.S.A.'s southern coastline in 2005, the sea surface temperature in the Gulf of Mexico was at the highest level ever recorded. 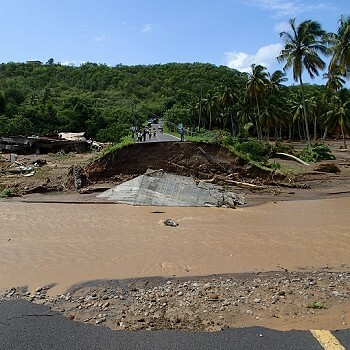 Even in tiny Dominica, May 2009 - the height of the 'dry season' - saw serious flooding of rivers, followed in the first week of September by Tropical Storm Erika, which caused the worst flooding ever of rivers in the east. 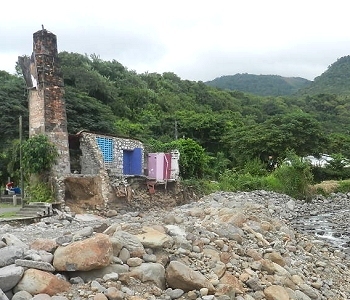 In October 2011, Tropical Storm Ophelia did the same to rivers along the west coast, washing vehicles off roads and damaging buildings - at the village of Massacre, a historic stone building which had been converted into a nightclub was destroyed, leaving little else but a chimney. Our rivers are flooding with a severity not witnessed before and in between, the dry spells are lasting longer. During the first four months of 2010, the whole East Caribbean region endured severe drought conditions. 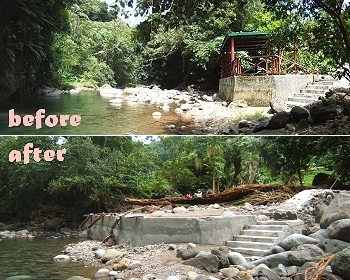 Many islands introduced restrictions on the use of water and even Dominica, which generates its own rainfall due to its high mountain peaks and ridges, had rivers running dry, even in the forested highlands. 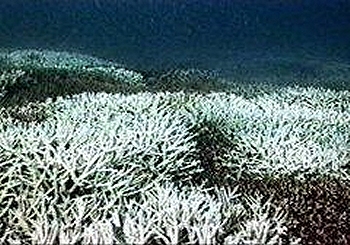 Rising sea temperatures are causing whole coral reefs (and the diversity of marine life they support) to die - a rise of just 2°C for a sustained period is all that is necessary. 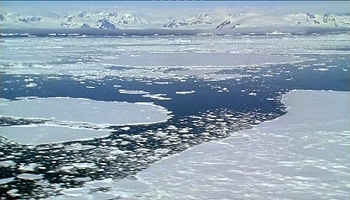 In the polar regions, the white, reflective surface of the ice caps is receding, giving way to dark, heat absorbent sea surface. Massive herds of flatulent cattle being raised for the hamburger industry and melting permafrost across the Tundra belt is releasing substantial quantities of methane, a greenhouse gas at least 25 times more potent than carbon dioxide. All in all, this could well trigger the beginning of a 'domino' effect which, once underway, may prove impossible to arrest. Scientific studies show that even if we completely stopped all CO2 emissions today, the amount of this gas already in the atmosphere will cause the global temperature to continue rising for at least the next 30 years. These studies also show that if we allow current levels of CO2 emissions to continue, the rise in global temperature will continue to accelerate to a projected 6°C increase in just a few decades! If this is allowed to happen, the effect of the altered climatic conditions on our human habitats and food sources will be one of utter devastation. The frozen waters of the icecaps and glaciers are above sea level. 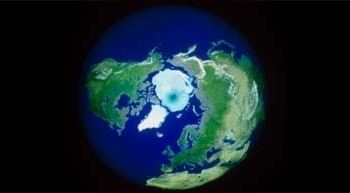 The ice over Antarctica is 2 miles deep! As the melting continues the sea level will also continue to rise, threatening many areas of coastal settlement around the globe. It is now estimated by the scientific community that by the end of this century it will have risen 6 feet and will continue rising at an ever increasing pace - see BBC documentary Earth Under Water. Question - What are we doing about it? Fiddling whilst Rome burns??? We have witnessed a series of international conferences, conventions and annual world summit meetings on the subject of climate change/ global warming throughout the last two decades, the most recent of which were staged in Copenhagen in December 2009, Cancun 2010, Durban 2011, Rio 2012, Warsaw 2013, Lima 2014 and Paris 2015. Result - a lot of talk. Action NIL. Commitment NIL. There is, of course, a reason for this inaction. Whilst we look to our democratically elected leaders to chart the course we all want, their masters are not the voters, but the super rich multinational corporations, who's agents patrol the corridors of power at all levels, simply buying the support they need. Predominant among these are the giant oil companies and power generating companies which rely heavily on the continued burning of fossil fuel to maintain their super profits. Politicians and civil servants are in their pockets and scientists are paid to dismiss scientific evidence as mere theory. They orchestrate campaigns of misinformation to frustrate any attempts to make changes. For example, the giant oil company Exxon has for several years been engaged in a multi-million dollar advertising campaign to promote inaction on climate change. Whilst there appears to be an online debate going on, I.T. companies are employed to distort these through a process known as 'astroturfing', whereby large numbers of fake bloggers are introduced to create the false impression of grassroots support. The situation is unlikely to change voluntarily. Our best hope is to make a unanimous appeal to those controlling the corporations to see sense and themselves take the initiative, for it is their grandchildren who will inherit the same impoverished planet as our own grandchildren. The first Earth Summit was held in Rio in 1992, attended by over 100 world leaders. 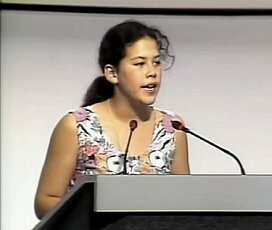 The most poignant address to this gathering was given by a 12 year old Canadian girl, Severn Cullis-Suzuki, lasting just 6 minutes - watch (26 million views on YouTube in just 5 years). 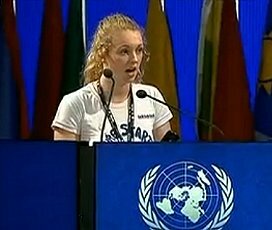 20 years later, at the Rio+20 Earth Summit, 17 year old Brittany Trilford from New Zealand makes another passionate plea to our world leaders, who do not appear to grasp the implications of inaction upon future generations - watch. 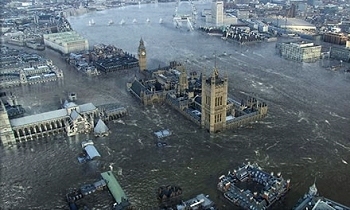 Rio+20 summary by Severn's Dad on Democracy Now!. April 2014 update The IPCC (Intergovernmental Panel on Climate Change) was founded in 1988 by the the United Nations Environmental Program and the World Meteorological Organization to provide the world with a clear scientific view on the current state of knowledge on climate change and its potential environmental and socio-economic impacts. Its data is collated by thousands of scientists from 195 member countries. 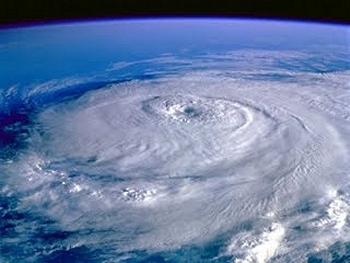 It has just released its 5th comprehensive report, affirming that global warming IS happening and that it IS man made. Since 1850 each decade has been warmer than the one before. The continuing effects of an almost 50% increase in the carbon content of our atmosphere since the beginning of the industrial revolution are: melting glaciers, warming and acidification of the oceans, dying coral reefs, rising sea levels, effects on the pattern and flow of ocean currents, increased scale and intensity of weather systems, an increase in the frequency and magnitude of weather related natural disasters, an increase in both flooding and desertification, extinction of species now at a rate of over 200 a day, a decline in the reliability of growing staple food crops, along with health threatening atmospheric pollution. This is yet another WAKE UP CALL, which our governments should treat with the urgency it deserves. Climate change is affecting every continent, impacting upon the lives of everyone. It is often the poorest nations that are most adversely affected and least equipped to prepare for natural disasters or to repair the damage in the aftermath. The USA is the largest contributor of greenhouse gas emissions, both past and present, yet is the most reluctant to implement the measures necessary to reduce emissions. It is itself suffering severe consequences - Hurricanes Katrina and Sandy interrupted power and water supplies and displaced thousands, tornados have destroyed whole towns, wheat and corn production have been reduced by drought, forest fires are more widespread and last winter the polar vortex extended as far south as Florida, inflicting bitterly cold weather on areas unprepared. Communities around the world are already beginning to demand compensation for the damage inflicted upon them by those responsible for climate change. This trend can only intensify as further destruction is inflicted by extreme weather conditions around the globe. This burden should fall less on countries and more on the multinational corporations which value short term profit above the health and well-being of the planet and which have spent millions in campaigns to discredit the scientific evidence. One salient point the scientists keep reminding us of is that the full effects of the carbon emissions we create take between 30 and 40 years to fully manifest themselves. This implies that even if we were to halt all carbon emissions right now, the global warming and related changes in our climatic conditions that we are currently witnessing would continue for that period of time. The rapidly melting Arctic glaciers are soon expected to interrupt the Atlantic gulf stream, resulting in a fall in European temperatures leading to another ice age for the region, even as the average global temperatures continue to climb. This could change the pattern of the ocean's conveyor belt currents around the globe, the effects of which we can only speculate. September 2015 update: Methane is a greenhouse gas at least 25 times more potent than Co2. 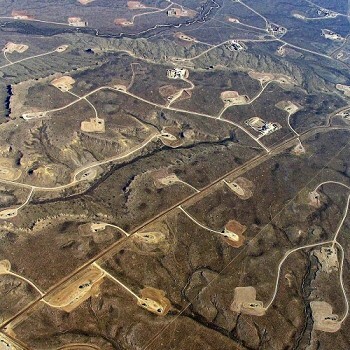 Since the turn of the century the 'dash for gas' has seen vast areas of the United States, Australia, parts of Europe, South Africa and many more places not widely reported opened up to fracking. Not only has this industry left in its wake a trail of environmental degradation, contamination of underground water, earthquakes, scarred landscapes, illness and death, but it has also released into the atmosphere vast quantities of methane, even from successfully drilled wells (a great many fail). This sudden increased emittance of methane over the past 15 years emanating from the fracking industry must surely dwarf that resulting from melting permafrost and flatulent cattle. The fracking assault has now arrived in Great Britain. Despite being unprofitable withe the price of oil below US$75 per barrel (it is currently around US$45), Britain's Prime Minister, David Cameron, is aggressively pursuing the fracking agenda, everywhere that is except in his own small constituency, where he has imposed a fracking ban! In much of America and in Queensland Australia, the stealth of this industry caught the public napping. 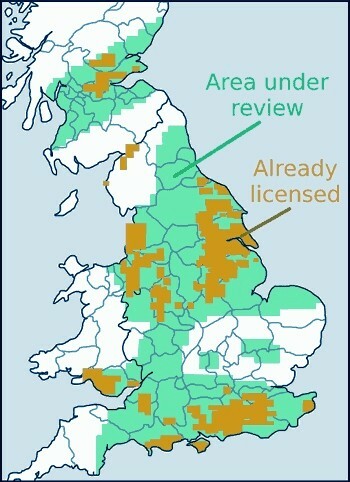 A more informed public across the UK, however, has seen a swelling number of community protest groups attempting to resist this fracking invasion of their cherished countryside, with some measure of success - so far. With each month of 2015 so far being the hottest on record, climate related disasters are on the increase globally. 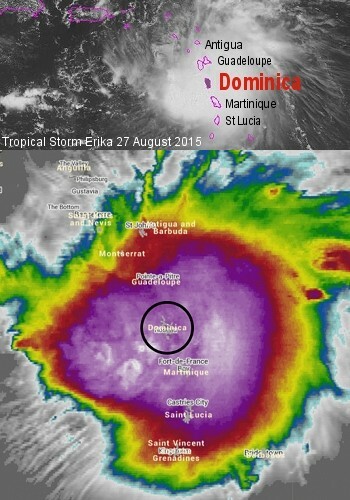 In August 2015 tiny Dominica was on the receiving end as the second Tropical Storm Erika in 6 years, just a category 3, dumped more rain in a short space of time than has ever before been witnessed - 15 inches in less than 12 hours! Every river and stream became a raging torrent, causing extensive damage to communities bordering rivers. 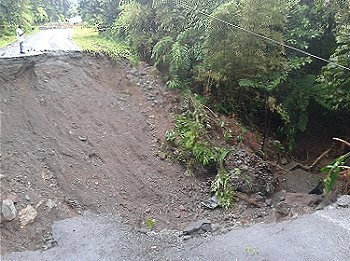 It washed away roads and bridges, cars and trees and triggered many landslides, literally dissecting the entire island. March 2016: Evidence of global warming continues into 2016 as February was reported to be the hottest month ever recorded. The problem was exacerbated further by a methane gas leak from the USA's second largest underground storage facility at Porter Ranch where, from late October 2015, more than 94,000 metric tons of methane spewed into the atmosphere over a period of 111 days. Porter Ranch is a community of approx. 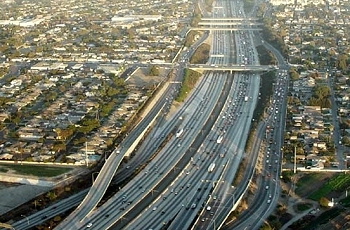 35,000 people and is locate just 25 miles north west of Los Angeles. Methane is invisible to the naked eye and could only be seen via infra-red photography. SoCal, the private contractor tasked with managing this facility was reported to have removed a faulty valve then failed to replace it. The local community and their pets began falling sick and had to evacuate the area. Though the leak has now been capped, the area is left contaminated as soil, water, clothes and furnishings remain impregnated. A move away from the burning of fossil fuel in favour of harnessing the vast resources of eco friendly renewable energy available to us is inevitable in the long run. The sooner we begin the process on a global scale, the sooner we can regain some hope of rescuing the earth for the survival and enjoyment of our descendants. Energy companies, aerospace companies and motor car manufacturers are uniquely positioned to take advantage of this trend by acting NOW! The first corporations to mass produce solar powered motor vehicles and passenger jets, to move more rapidly towards solar, wind and hydro generated power plants, will be the ones to corner and monopolize this inevitable future marketplace. Not until the next climatic catastophy devastates another population centre, just like Katrina did to Louisiana in 2005, might the panic reaction of governments be to take measures that should be in place already - like imposing and enforcing hefty taxes on all carbon emissions, then the competitive edge of those companies that have gone green will pay handsome dividends for their shareholders. All countries, all corporations, should grasp the initiative to kick start the process now, thus positioning themselves for maximum benefit. Even the tiny island nation of Dominica is uniquely placed to take advantage of this 'new world' scenario by becoming a regional leader in the development, showcasing and marketing of renewable energy products and methods appropriate to our georaphic location and climate. Already we produce almost 50% of our power from hydro. A few windmills in the mountain passes or a solar station in the rain shadow part of our mid west coast could easily transform that figure to 100%. Geothermal energy is also a possibility and EU funded studies are already underway in the south of the island with a view to harnessing this free power source and possibly even exporting some of it to neighbouring Martinique. Individuals also need encouragement to install private solar and/or wind generating systems by tax concessions and the reverse metering system already being practiced in some European countries and now also being considered in some of our neighbouring islands. Congratulations to our Prime Minister, Hon. 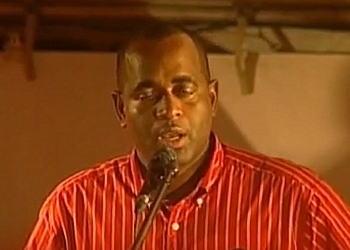 Roosevelt Skerrit who, on December 18th 2009, secured an increased majority for his Labour Party, going on to win the elections again on December 8th 2014. We Dominicans are optimistic that he will recognize the amazing opportunities that exist to move Dominica forward in ways that utilize the free power that mother nature has bestowed on our island, whilst at the same time preserving and protecting our island's inheritance - it's natural beauty and integrity. Achieving this goal will send an important message to the rest of the world - that if a small, poor, independent nation like Dominica can reduce it's CO2 emissions to near zero, illustrating a maturity and commitment not just to Dominicans but to the world as a whole - then they too can achieve the same. 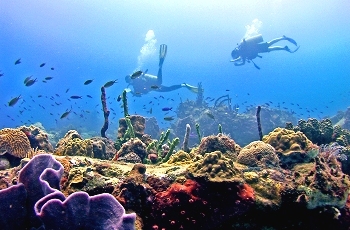 Dominica has long been regarded as the 'Nature Island of the Caribbean'. It is truly an emerald gem in a region were tourism and urban expansion are taking their toll on the environment. Today, the issue is about good stewardship, exploiting this wonderful slice of nature whilst at the same time nurturing and protecting it for our future generations of Dominicans and their visitors to enjoy. London in the year 2050? In this 2 part documentary, Sir David Atteborough undertakes a personal journey to discover how global warming is changing the planet he knows so well., finding out what's causing it and whether mankind is to blame. Sir David Attenborough has devoted his entire life to the study, documentation and filming of our planet's natural wonders and diversity. The many incredible BBC telvision documentaries he has made have enriched our lives and educated us from the comfort of our own homes. Opposite are some of those now readily available on dvd. In this cinema released film, set in the year 2055, the presenter looks back from an impoverished planet, ravaged by the effects of climate change and asks why, when the obvious was staring us in the face, we chose not to take the necessary action to save our global environment. In this 8 part documentary, Professor Aubrey Manning takes us on a voyage of discovery to locations all over the world as he attempts to unravel the secrets of our planet and the life it sustains. Please note that some of the above dvd documentaries are available only in region 2 (Britain and Europe) format. Those in North America or elsewhere will require a multi region dvd player or a pc media program with region 2 decoder. 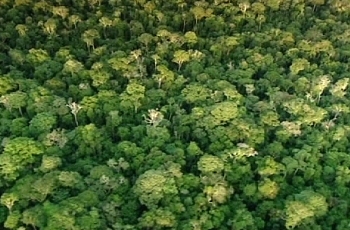 In this 3 part documentary, Sir David Atteborough looks at rainforest destruction, global warming, extinction of species, rising sea levels and drought. Our actions over the next 100 years will determine the future of life on earth. In this 5 part documentary, scientist Dr. Ian Stewart takes us around the globe to examine volcanos, the atmosphere, ice and the oceans, the four active elements which shape the world on which we live. He then looks at the impact of mankind, a recent development in the earth's history. In this 3 part documentary, Andrew Marr takes us on the voyage of Charles Darwin, as he uncovered the secrets of the evolution of life on earth, then examines some of the gross misinterpetations of Darwin's ideas that followed with drastic consequenses for mankind. 2009 celebrated the 150th aniversary of the publication of Darwin's controversial Theory of Evolution according to Natural Selection, which changed forever our understanding of ourselves and the world we all inhabit. The Centre for Alternative Technology is located near the town of Machynlleth, Wales, U.K., where it educates visitors by demonstrating an array of environmentally friendly methods of generationg power, fertlizing our crops and caring for our environment. June 2010 saw the opening of it's new facility WISE (Wales Institute for Sustainable Education) and the launch of a new website dedicated to persuading both the general public and Britain's policy makers that a zero carbon Britain is both desirable and achievable by the year 2030. Nature Island Destinations has, since 1997, provided an island-wide information and booking service for Dominica's stay-over visitors - accommodation including private rentals, vehicle hire plus selected hikes and tours. Safe Haven Real Estate is the most professional and successful realtor in Dominica. Based on the UK model, it has a retail outlet, inhouse lawyer, core of permanent staff and a website which is updated daily.